My preferred mediums of art are actually many and usually depend on the project I’m working on. My ultimate favorites are graphite, colored pencil, digital art and photography. I also really enjoy watercolor, acrylic and pen & ink. I usually let the reference material tell me what medium would work best! My artistic journey started way back when I was a little girl. I was always drawn to picture books like the works of Beatrix Potter and such with beautiful images to admire. I also loved to draw and color whenever I could. As for photography, I won a little camera in a book reading contest when I was in 4th grade. WOW did I love that camera. From that moment on, I was hooked on the photography bug! Looking back, I am not surprised I wound up creating full time as my career path. It’s what I really love to do. My creativity is always ignited by something that grips me emotionally. It could be the beauty I see in a person or place or a touching moment I happen to glimpse. 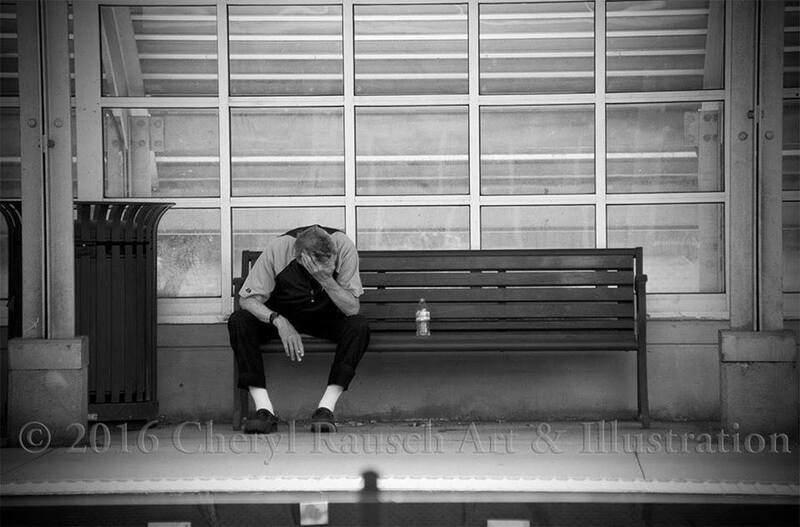 When those moments happen, I want to create an artwork that shows that moment, that emotion. My goal is that the viewer can appreciate the feeling as much as I did. When creating a new work, I do plan ahead of time as to how the image will be created. I have an idea in my head on what I want to convey, and then I work out how best to do it. That’s when I work out what medium will work best for the situation. Sometimes the decision-making is hard, but that’s what makes it fun! 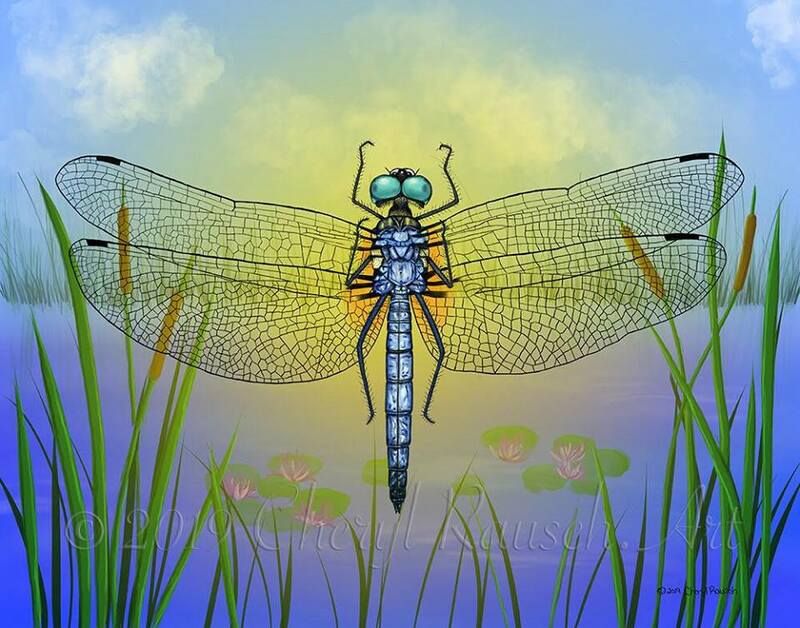 Blue Dasher Dragonfly illustrated in Procreate on an iPad Pro using a real specimen. Illustration by Cheryl Rausch. I see that you use both a digital method of sketching and more traditional pencil and paper. How do you choose which project is best for each medium? I love working in traditional mediums. That’s how I was taught, and that’s what I’ve used for many years. However, I’ve recently been talking to other commercial illustrators who have told me that agents and publishers want digital art. I then saw an agent a few weeks back to show him my portfolio. He loved my nature work, but told me specifically that everyone wants digital. That’s why I’ve been working on it feverishly lately - to add more digital works to my portfolio. I love both, and am now busy making sure that what I create digitally will have the same “look & feel” of my traditional forms of art. Oh my goodness, asking what my favorite subject is to photograph is like asking who my favorite child is! LOL! I have to say that photographing people is very rewarding. You learn so much about your subject, even by how they carry themselves in front of the camera. I love that moment when you see your subject start to relax, allowing their personality to come out. That moment is so special to see. It’s each individual’s “uniqueness” that makes them beautiful. I consider it my job to capture that on an image. I see the role of art in the community as a respite from the usual chaos and drama of everyday life. I hope that we as artists can give the audience a brief moment of joy, laughter, contemplation or peace when experiencing our artworks. I‘d like to think that we can help the viewer experience the amazing scenes or moments we discover and portray in our works. Personally, the most engaging art events I enjoy are actual art shows. Just about every community has one and I really enjoy browsing the booths and chatting with the vendors. It’s one of my most favorite parts of summer. When winter hits, I look forward to the “One of a Kind” show at the Merchandise Mart every December. I go every year and have a great time while I’m there. There’s nonstop inspiration everywhere you look at any of these shows. Due to the fact that galleries are harder to come by, I find art installations in the most creative spaces. Our local coffee shop in Lombard - “The Corner House” has a constantly running exhibit of art from the local art group. Other spaces are in nature centers and forest preserve district locations. For example, Mayslake Peabody Estate (FPDDC) has a gallery space that exhibits group shows all year round. Trailside Museum of Natural History in River Forest (FPDCC) does the same thing, and as a matter of fact, I’ve got a solo exhibit up there right now. I’ve also enjoyed viewing exhibits at several restaurants around the area. I even had a friend text me several photos of the inside of a tattoo parlor which was loaded with beautiful images of birds! I just love the idea that local businesses in the area are welcoming art groups in their establishments. When you feel stuck, how do you get your creative juices running again? Oh, you wouldn’t believe how many books I’ve got on my favorite artists that I use for a creative boost! I have everything from Salvador Dali to Chuck Close to Vivian Maier. If I ever feel a bit stuck, I go straight to my book shelf. And it works every time. 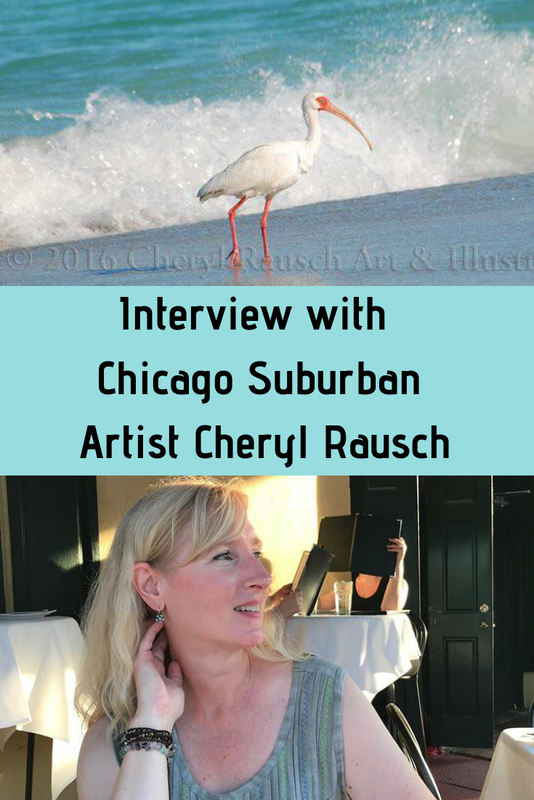 Thank you so much to Cheryl Rausch for sharing her talents and vision with us! 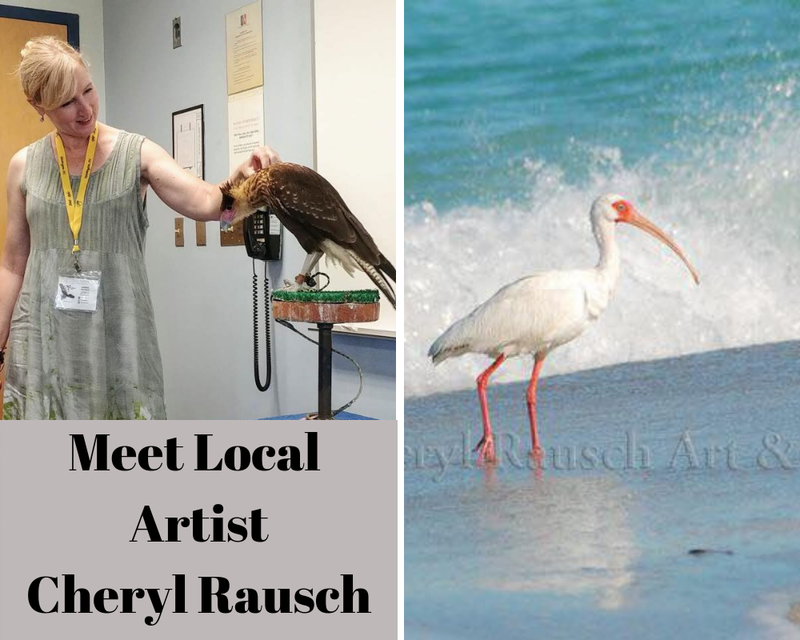 Cheryl is hosting a Cheryl Rausch.Art Meet the Artist of "The Art of Nature" Exhibit at Trailside Museum of Natural History February 3 from 1PM-3PM. For more information, check out the Cheryl Rausch.Art Facebook Page. 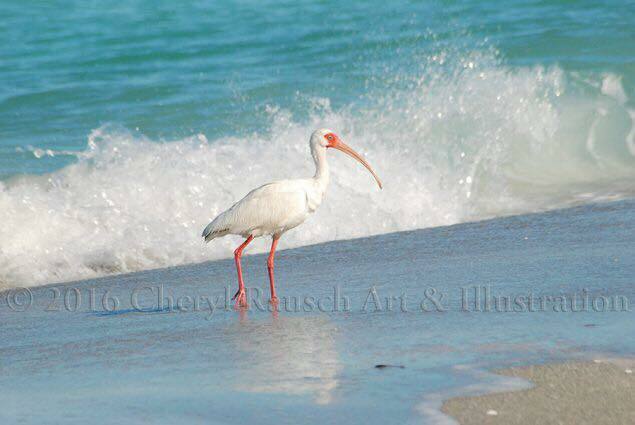 Be sure to check out Cheryl's art on her Cheryl Rausch.Art Illustration & Photography website. Great spot to find a new treasure for your home or office! 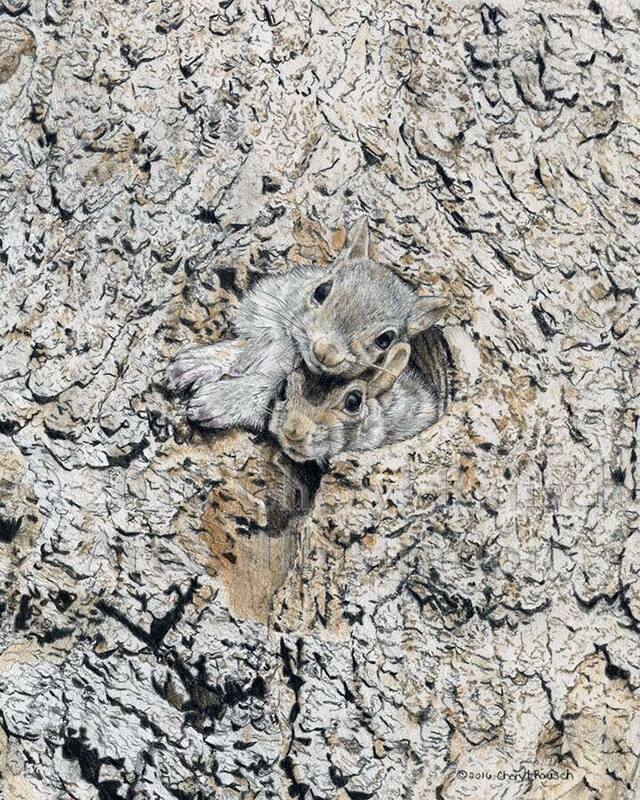 I can't believe those squirrel babies aren't a photograph. Are you SURE the caption saying it's a colored pencil illustration isn't wrong? I mean, WOW!!! Lol! Yes, she did the illustration with colored pencil based on one of her own photographs. She is amazing! I got to see her sketch at an art event. Incredible! If you follow her Facebook, she shows a lot of what she is doing with a variety of media pencils, digital, photography and more.